One of the hardest things that faces Small Business owners & entrepreneurs is that they have an incredible amount of things that they need to do. They wear too many hats, and they’re faced with the difficulty of figuring out what to spend their time on. Entrepreneurs need to work diligently to ensure that they not only work “in” the business, but work “on” the business. This is MUCH easier said than done, particularly when you’ve got a myriad of long term and short term strategic and tactical things to wrestle through. Gino Wickman, in his book “Traction,” gives Entrepreneurs tips on how to build traction in their business – and really move forward toward their goals and vision. Compartmentalizing means taking everything you need to accomplish, short term and long term, labeling it, and then placing into the appropriate compartment. 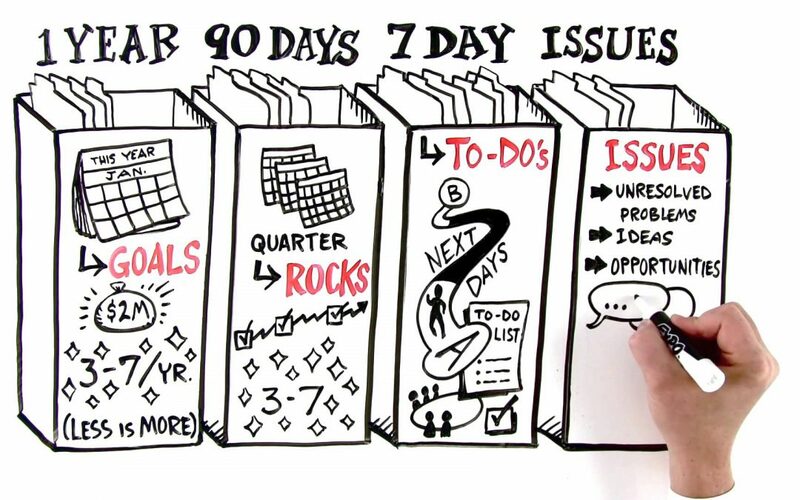 This helps your team have a visual picture of what needs to get done, and when it needs to be accomplished. These are 90 day “rocks,” this is for initiatives that need to be accomplished this quarter. Any action item that a team member commits to that must be completed in the week. This is where you put unresolved problems, opportunities and ideas that you’ll eventually want to act upon. There are both Long Term, and Short Term compartments in the issue. You’ll want to put any issue that cannot be handled within 90 days into a long term compartment and so that they will not distract you from getting things done.